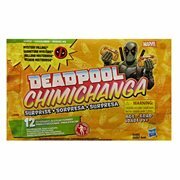 Chimichanga Alert! 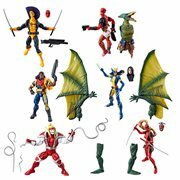 Get Your Deadpool Toys and Merchandise Here! never been the same! 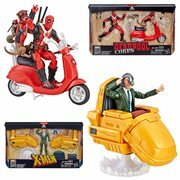 Known for his insouciant, talkative manner, the smart-alecky "Merc with a Mouth" is the inspiration for Deadpool action figures and gobs of other fan-demanded items. Created by Rob Liefeld and Fabian Nicieza, antihero Deadpool, aka Wade Wilson, has appeared in comic books from Marvel since February 1991's The New Mutants #98… and the world has never been the same! Known for his insouciant, talkative manner, the smart-alecky "Merc with a Mouth" is the inspiration for Deadpool action figures and gobs of other fan-demanded items. Originally a supervillain, the trained assassin and mercenary evolved over time into the current more well-known antihero. In addition to comic books, he's been seen in animated and live-action films, television, and web series, and in video games. 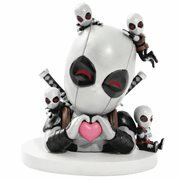 Therefore, there are many a Deadpool statue, plush, and other collectible article for his many fans to covet. "Bad Deadpool… Good Deadpool!" You Can Be Both! Good guy / bad guy - he's an excellent marksman, swordsman, and hand fighter, with extraordinary healing powers and longevity, plus devices for teleportation and holographic disguise. There are Deadpool costumes for sale, plus T-shirts, caps, and masks you can wear to assume this enviable superhero's identity for your own. Pick up some prop replicas and jewelry while you're at it. Then you can be bad Deadpool or good Deadpool! "Superhero Landing!" Be Glad You Landed at Entertainment Earth! 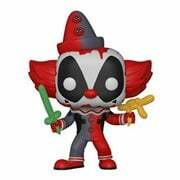 You can't miss with the Deadpool Funko Pop! 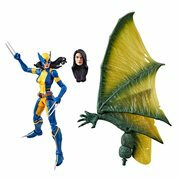 Vinyl figures and other products you'll find here. Our tremendous selection includes car graphics, steering wheel covers, seat covers, and sunshades; backpacks, wallets, and purses; watches, pins, and key chains; banks, clocks, bookends, mugs, and glassware; plus playing cards, decals, magnets, models, and wall art. Whatever you do, don't forget your Deadpool Chair Cape™ and those adorable bobbleheads, push puppets, and Pin Mates™. Like the foulmouthed Merc, they're %$#&^@* awesome!